The chain of islands off Russia’s Pacific coast may get a special status titled 'territory of accelerated development' (TAD). Companies that operate in a TAD pay reduced customs duties and are entitled to a preferential income tax and value added tax regime. The Kuril Islands may get territory of accelerated development (TAD) status, Alexander Galushka, Minister for the Development of the Russian Far East told the Regnum news agency. The Russian government approved a 10-year developmental program, under which around 70 billion rubles ($ 1.1 billion) will be allocated to the strategically important islands. A part of these funds may be used to set up a TAD. Moscow wants to transform the islands into an economically developed region by 2025. Companies that operate in the TADs will have to pay reduced customs duties and will be entitled to a preferential income tax and value added tax (VAT) regime. Russia is interested in attracting foreign companies, including Japanese players, Galushka told Regnum. The Sakhalin Region, which includes the Kuril Islands, is already preparing a proposal for the formation of a TAD, Elena Sudakova, Acting Minister of Investment and Foreign Affairs of the region told TASS. The strategic location of the Kurils and their proximity to the economic powerhouses of the Asia-Pacific make them an ideal candidate to have TAD status, Sudakova said. She identified fishing, gold mining and tourism as the industries with maximum potential on the islands. “According to our experts, the Kuril Islands (especially Kunashir) have the best conditions for the cultivation of scallops, sea urchin, sea cucumber and seaweed. These are the products that are in high demand in the Asia-Pacific,” Sudakova said. 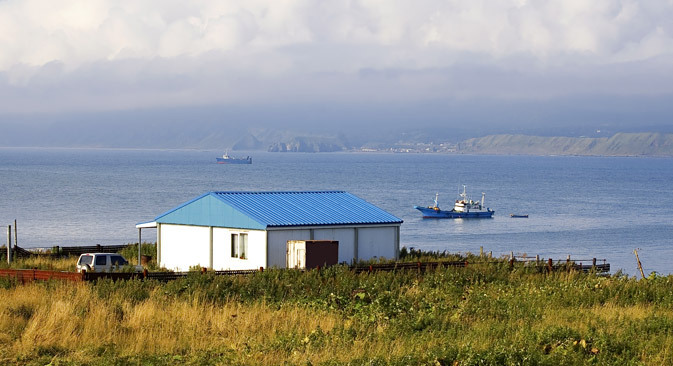 “The best way to create export-oriented industries on the Kurils is to do it in cooperation with Asian manufacturers and retail chains to ensure that the products meet their requirements,” Natalia Stapran, associate professor at the Moscow State Institute of Oriental Studies told RBTH. Investors can participate in a TAD by opening a subsidiary in partnership with the Far East Development Corporation (the company managing the TADs). An investor can hold up to a 49 percent share in such a partnership. “We have informed our Japanese colleagues that we are willing to work under this model, in case they are interested in Far East TADs and in the Kuril Islands, in particular,” Galushka said. Despite the territorial disputes between Russia and Japan, experts are optimistic about the prospects Japanese investments on the Kuril Islands. Peter Samoilenko, Head of the Center for Asia-Pacific Studies at the Russian Institute of Strategic Studies (RISS) said Japan and China have a strong economic relationship despite a dispute over the Senkaku-Diaoyu Islands in the South China Sea. “Despite the relatively aggressive political rhetoric and occasional aggravation, the dispute does not prevent the two countries from developing mutually beneficial economic projects,” Samoilenko told RBTH. He added that the profit motive might drive Japanese companies to invest in the Kuril Islands. Russian Prime Minister Dmitry Medvedev launched the first three TADs in June. All three are in the Russian Far East. The Khabarovsk and Komsomolskaya TADs are in the Khabarovsk Territory, while the Nadezhdinskaya is in Primorye.